Photo by Simona Carini Eggs, Napa cabbage and carrots in a quick Indonesian dish. When people learn I am a food writer, sooner or later, they ask me about writing a cookbook: Have I done it or thought about doing it or am I doing it now? Until recently, the answer has been "no" on all counts. A cookbook is a lot more than a collection of recipes and beautiful photos to go with them. Writing a cookbook is an immense labor of love and I have the deepest respect for all who have done it, from one-ingredient, short-and-sweet books to encyclopedic works. But I never said never. Then my friend Eloisa Vargiu came along with an idea, some 30 food bloggers got on board with it and suddenly I found myself contributing to a cookbook — a more manageable endeavor that still gives you a sense of the effort involved. The idea was to write a cookbook (in Italian) inspired by the map of the game Risk, which is in Italian is called Risiko! Hence the book title: Risikitchen. For each of the 42 territories on the map, a contributor provided two recipes (one savory and one sweet) with brief notes placing them in historical and/or cultural contest. My contributions covered the Western United States (fresh chèvre salad and blackberry cobbler) and Indonesia (orak arik wortel and black rice pudding), the first as a tribute to my adoptive country and the second as a way of visiting through food a place I haven't been. I knew nothing about Indonesian food and, after researching, I know only a tiny amount now, but the pleasure was in learning, reading recipes, trying out dishes and then finding the savory and sweet spot for my palate. 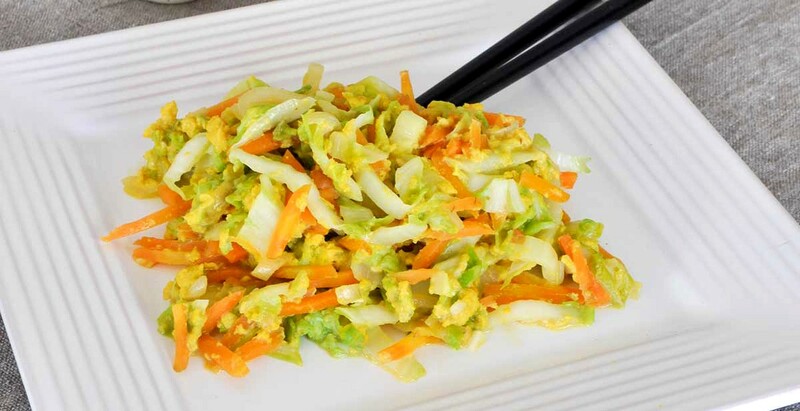 Orak arik is a scramble of eggs and vegetables like Napa cabbage. 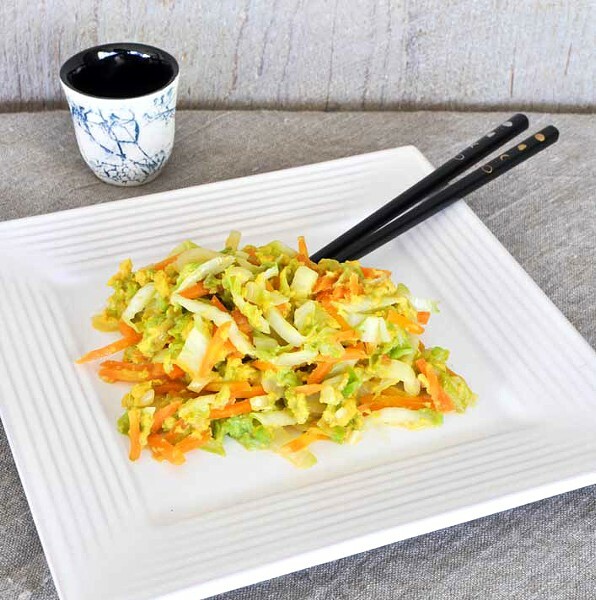 A variation, orak arik wortel includes Napa cabbage and carrots. 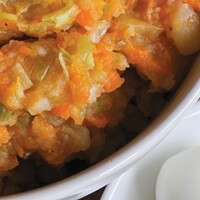 The word "wortel" caught my attention because it reminded me of the Belgian wortelstoemp, a potato and carrot mash I've written about ("A Hearty Belgian Mash," April 20, 2017). Wortel means "carrot" in Dutch and the presence of this word in Bahasa Indonesia (the name of the Indonesian language) bears witness to more than 300 years of Dutch colonial rule, which ended in 1949 when the Dutch recognized Indonesian sovereignty. The use of a wok for cooking the dish is a testament to the Chinese influence in Indonesian cuisine. Thanks to ingredients easily found in our territory, this recipe offers an accessible virtual trip to Indonesia. This dish cooks quickly. Prepare all the ingredients before starting to cook so you can add them quickly. Slice the shallot into thin half-moons. Peel and mince the garlic. Scrub and skin the carrots, then slice them into matchsticks (a mandolin makes this step fast and easy). Wash the Napa cabbage and slice the leaves about 1/4 inch thick at the level of the crinkly leaf blades, about half as thick when you get to the white ribs. Break the eggs in a bowl (preferably with an easy pouring spout) and lightly whisk until just blended. Add the salt and whisk again briefly. Heat a wok over medium heat, add the olive oil and swirl it around. Add the shallots and then the ginger, stirring for a couple of minutes. Add the garlic and stir for 30 seconds. Toss in the carrots and stir for 2 minutes. Add the cabbage and stir for 20 seconds before adding the water. Keep the heat level throughout so the vegetables sizzle gently. Place a lid on the wok and let the vegetables cook for 3 minutes, stirring once halfway through. Remove the lid and slowly pour the eggs on the vegetables while stirring. Over medium-low heat, keep stirring until the eggs are just set. Adjust the salt and sprinkle the pepper. Give the dish a good stir and serve immediately. Recipe and photograph from Risikitchen! appear here courtesy of the cookbook's editor Eloisa Vargiu.